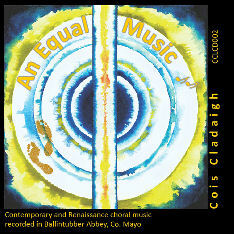 This is Cois Cladaigh's second CD. It was recorded in the wonderful space of Ballintubber Abbey in Mayo, Co. Galway. To order a An Equal Music CD please click here. We have been singing this lovely setting for a number of years now. Its simplicity and gentle ending is always appreciated by audiences. Kiitkem südamest was composed by Estonian composer Urmas Sisask and is a heartfelt praise to Mary. Cois Cladaigh discovered Sisasks’s music in the early years of the 21st century thanks to Heye Rumhor. During the Estonian tour, the choir visited the planetarium in Jäneda in northern Estonia where Sisask composes and he spoke about and played some of his music. Sisask also conducted Cois Cladaigh singing Kiitkem. Hail Mary, you have come into world without sin, heartfelt praise to Mary, rejoice together, hail Queen. You have been chosen amongst women, heartfelt praise to Mary, rejoice together, hail Queen. You have carried the Creator for us as a mother, heartfelt praise to Mary, rejoice together, hail Queen. Purest Virgin, you have given Jesus to us, heartfelt praise to Mary, rejoice together, hail Queen. Lindberg’s settings typically have a strong contemporary jazz feeling and this setting of a Shakespeare sonnet is one of his better known and most recorded pieces. Rónán Scaife who used to sing with Cois Cladaigh brought the choir this piece. The poet says that his love will last until the black crow turns white and the white swans turn black and sea water turns into freshwater. Busto was commissioned by Cois Cladaigh in 2002 to commemorate the choir’s 20th anniversary. The choir met him again in 2005 in Cork and in 2006 when it toured the Basque country. This setting of Petrarch’s sonnet to his famous “Laura” is rhythmically strong for the opening sections and Monteverdi shows off his considerable power in painting the poetic images with music. The giddy 3 beats to the bar has a strong dance-like sense, interrupted sporadically with a 4 beat bar resembling the gusts and eddies of the wind. The last part of the sonnet opens with a 4 beat section and is taken at a slower tempo to reflect the pathos of the words. There is a penultimate flurry of rhythm reflecting the singing birds and lady’s love before the final, tragic line which Monteverdi accentuates by piling semitone against semitone and then resolving the clash. This composition has several different styles from SSAA sections to TTBB parts only, then full 8 part writing and even a small piece of vocalization at the section “se obmutuit” where Alcaraz indicates that the choir should use the sound “ssshhh”. This comes from Frescobaldi’s “Messa sopra L’Aria di Fiorenze” and was given to us by Christopher Stembridge. Whitacre has used many translated texts of the Mexican poet Octavio Paz and this is one of them. He has a natural adeptness in writing for choirs and his compositions, although sounding complex are quite manageable. In this piece, he generates wonderfully stacked cluster chords throughout the work. This is from his 3rd book of madrigals and Monteverdi sets the Guarini text with a florid style having lines tumbling over one another and answering each other in the opening “Spring” section that continues through the middle third of the piece. However, in the last section where the poet says “ma, non son Io” (but not me), the style changes to a declamatory, strident mood. This wonderful 8-part setting of the Nunc dimittis text shows off the different sections of the choir. Soloists include Maeve Canavan and Matt Wallen. The mysterious and serene opening sets the mood for the journey the newly departed is about to undertake. John Buckley, an Irish composer dedicated this piece to Cois Cladaigh. It uses a Percy Bisshe Shelley's poem. This piece was written for Cois Cladaigh in 1984. It is structured with the chromatic harmonies of the 16th century composer, Carlo Gesualdo, in mind. The poet goes on to say amongst other things that tobacco is the worst poison on earth and that it takes away man’s libido. The poem finishes by saying that it was the Devil who first planted tobacco. In 1959 Sir William Harris set this wonderful prayer by John Donne for double choir. When Cois Cladaigh was learning this song, the book by Vikram Seth “An Equal Music” was published and Seth chose these few words from the poem by John Donne that Harris had set. The coincidence of this led to the choice of these words as the title for this CD. Caliban's Song was written by New Zealand composer David Hamilton, whose Lux Aeterna featured on Cois Cladaigh's first CD. The text is taken from Shakespeare's play "The Tempest". Hamilton has cleverly worked the music creating a strong sense of the atmosphere of the poetry. Sometimes a thousand twangling instruments will hum about mine ears. And sometimes voices that if I then had waked after long sleep will make me sleep again. Ready to drop upon me that when I waked, I cried to dream again. This is a setting of portions of the Angelus and the Ave Maria. Biebl’s setting of the Angelus text makes use of plainchant sung by solo voices and in the Ave Maria section the rich harmonies of an SATB choir and a solo trio. Martin Beuster and Kevin Hough sing the first piece of chant; the trio is made up of Maeve Canavan (soprano), Laura Brogan (alto) and Matt Wallen (tenor); the second piece of chant is sung by Matthew Harrison and the third by Michael Burke. This is a highly charged and dramatic setting of this poignant text. Hogan’s settings of spirituals always portray the story and the feelings behind the words. His use of the paired basses and tenors as a sort of martial drum roll gives a menacing feeling to the opening of this piece. The work has the typical thumb print Hogan-type ending where you can see the walls of Jericho come tumbling down.